Can you believe S will be turning eleven this month? She was 2 1/2 when I decided to start this little pattern company, and she’s grown up surrounded by patterns and fabrics and photo shoots. The other day she told us she wants to work with photography as an adult. To a certain degree, she always has. After every photo shoot she gets to play with the camera set up, and she has a wonderful time staging photos, posing, and trying different styling ideas. She’s taking an after-school cinema class and is currently writing a screenplay with one of her classmates, and she makes stop-motion animation films in her spare time. So it will be interesting to see if she really does do something in this area when she’s older. But before that happens, let’s talk about her new Secret Agent Trench Coat, shall we? When the design team at Kaufman asked if I wanted one of the Woodland Clearing fabrics to also be available as a coated laminate, of course I jumped at the chance. 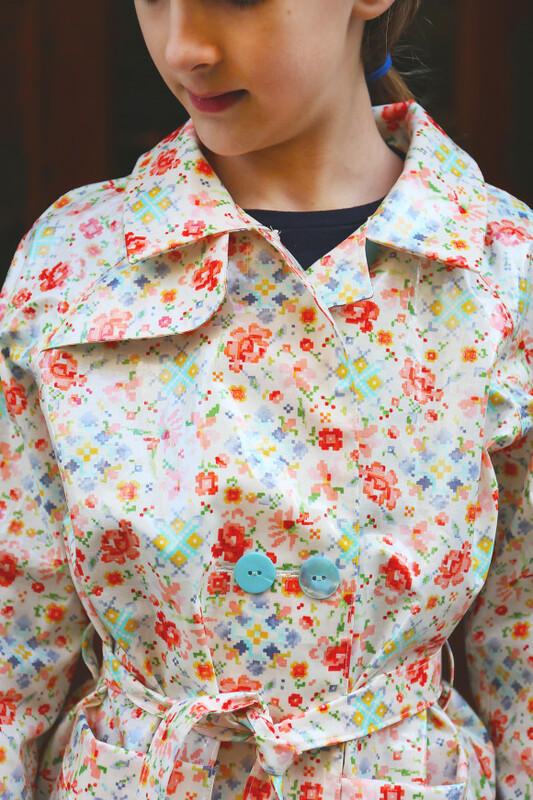 Laminates are useful for so many projects, and of course the first thing I wanted to make with the fabric was a trench coat for S, who has been requesting a replacement since she outgrew her last one (which was a favorite). I decided to do a lot of topstitching on this jacket. It keeps all the edges looking crisp and sharp, especially since it can be a little tricky to press laminates. And it’s easy to do if you have a walking foot. 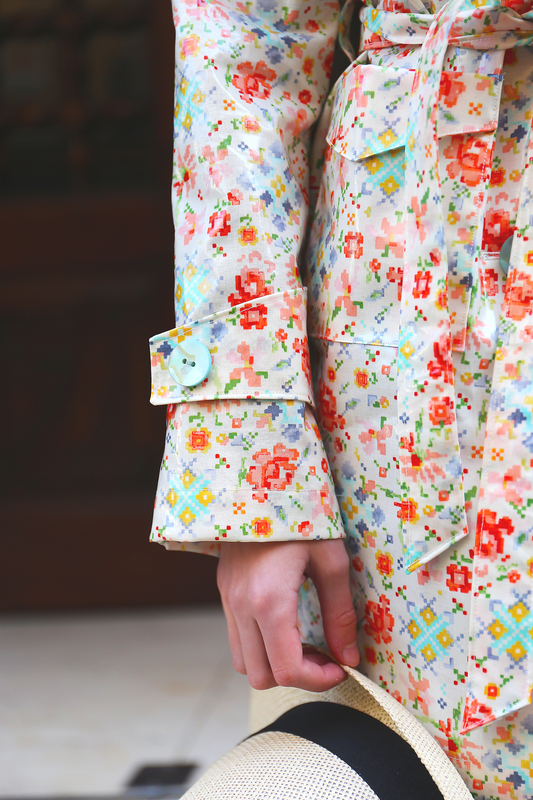 I didn’t do anything special when sewing this jacket beyond using the walking foot, actually. 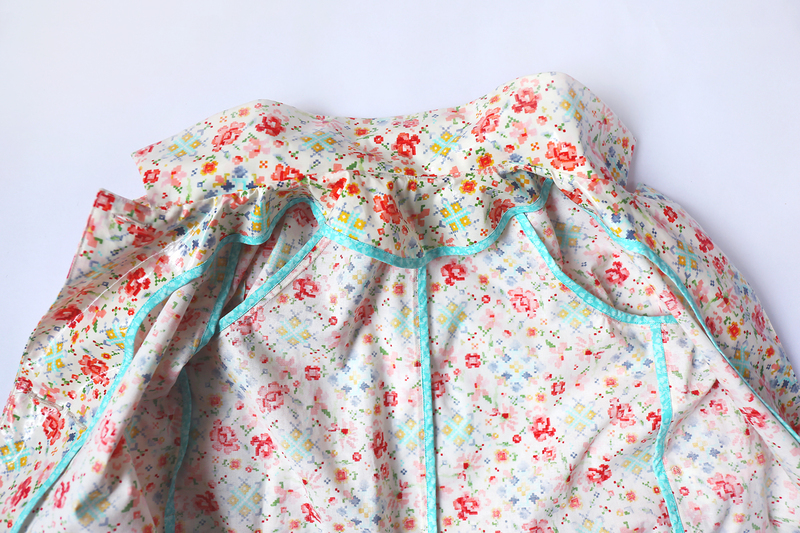 I used the turquoise floral print from the Woodland Clearing collection to make bias binding for the seam allowances. 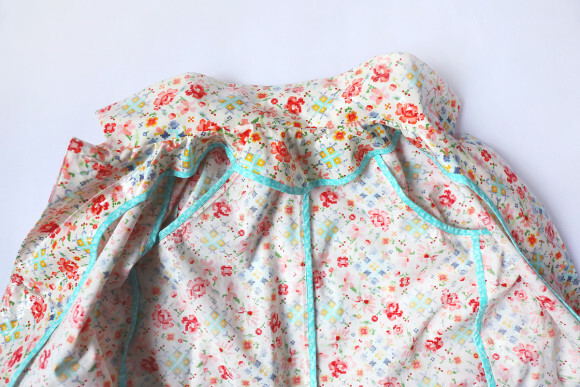 The binding allows you to make the inside as pretty as the outside without adding a lot of bulk, and it really doesn’t take very long to sew the jacket or to add the binding. You’d be surprised, I think. She really likes it. In fact, she was waiting and waiting for a rainy day so she could wear the coat and her new rain boots, but we don’t have them very often in Madrid! Last week we finally had a morning where there were a few sprinkles, and she got herself all ready for school in record time. Here’s a photo I snapped with my phone on our walk to school that morning. 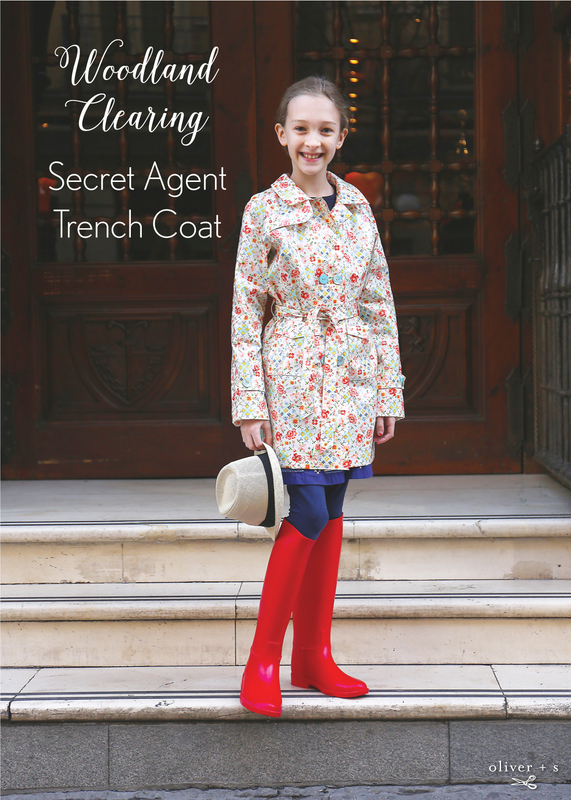 If you sew a Secret Agent Trench Coat or make something with the Woodland Clearing fabric collection I hope you’ll share them with us! Tag your Instagram photos #secretagenttrenchcoat or #woodlandclearingfabric or add them to our Flickr group. 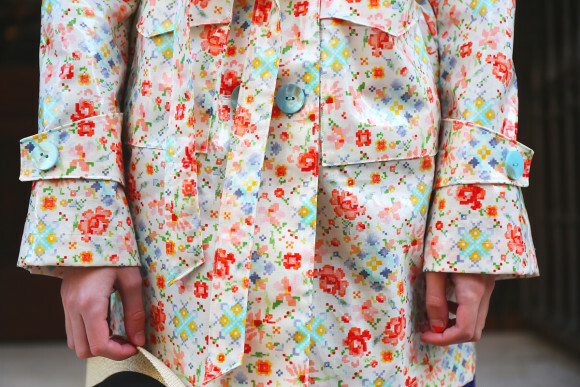 I LOVE that pattern – I LOVE the new coat – LOVE it!!! You inspire me to keep sewing out of my comfort zone!!! Beautiful rain coat!! I need to find this fabric for my daughter! The Secret Agent was my gateway to O+S, so I’ll always be fond of it! S and the coat are just lovely. 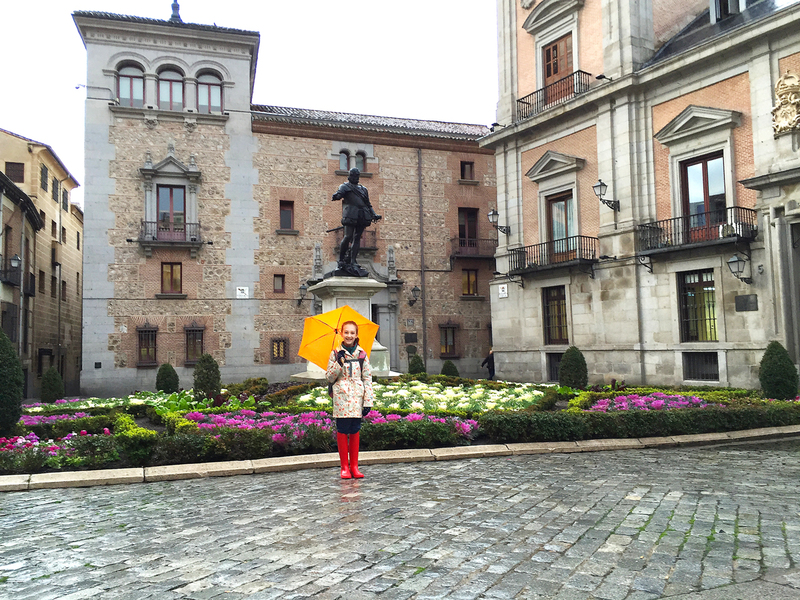 Here’s to some more rainy days in Madrid so she gets a chance to show it off. 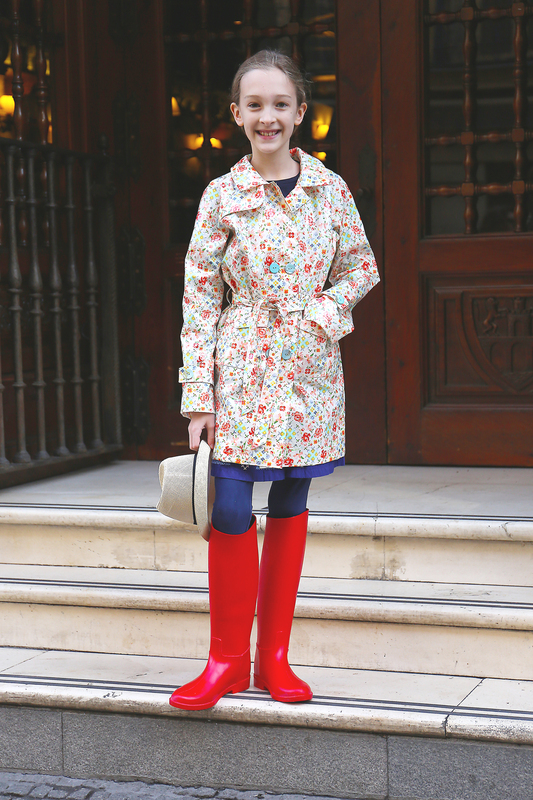 This coat is looking very beautiful specially the color combinations. I simply love this! My order for your Woodland Clearing laminate fabric arrived from California a couple of days ago. It is lovely! I looked & read everything I could about sewing laminated cotton before starting. It is different but lots of fun. Since I am making this for my 10 yr old granddaughter I was delighted to see that the pattern had a girly, girly version with a dropped gathered waist. Too adorable — but have I made a bad choice in thinking that I can gather laminated cotton & not have it look too sticky outy?Perhaps if I topstitch at the gathers it may lie flatter. Pressing does next to nothing. Any suggestions for adding the gathered skirt would be appreciated. Oh, & will it gather easily. Should I lengthen my stitches even more? I have to remember not to baste stitch over the stitch line to avoid seeing the little needle holes. Linda, what about pleating the skirt part instead of gathering it? You might find some good suggestions and ideas on our discussion board as well. Liesl, I did gather the skirt part (stitch length 3.75). It wasn’t as full in the gathers as what I had imagined so it doesn’t look sticky outy. Topstitching along the waist line seam (above the gathers) also helped. I may use pleats on another for a different look. Great idea. 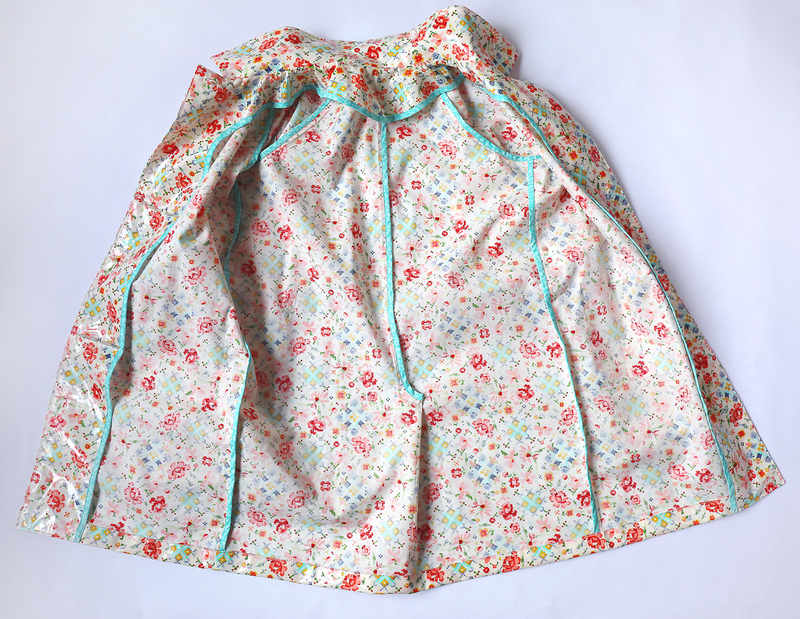 The rain jacket has turned out superbly & I can hardly wait to give it to my grand daughter. When she saw & felt the laminated fabric she went a little crazy! Love at first site (good choice Grandma). What a lovely, easy to follow pattern. Easy, Peasy. Thanks so much.